Have you ever seen the movie Apollo 13? 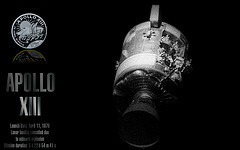 This is the film based on the ill-fated flight of Apollo 13 that took place in April of 1970. Two days into its flight to the moon, an oxygen tank exploded on the service module, causing astronauts Lovell, Swigert, and Haise to completely miss their opportunity to land on the moon. Their new mission was simply to survive the remainder of the flight and return safely to earth in one piece. My favorite quote from the movie is when Gene Kranz, played by Ed Harris, told the mission control personnel, "Let's work the problem people. Let's not make things worse by guessing." As the ground crew was attempting to assess what the problems were onboard the spacecraft, a lot of conjecture was taking place regarding those problems and possible solutions. Kranz had to remind his people that they needed to work the problem based on the hard facts that they had in front of them, and not to base their solutions on guesswork. The lives of three men were depending on intelligent, fact-based solutions. I like Kranz's quote so much, that I printed off a portion of it, "Work the Problem," and put it up on the wall of my office. It inspires me to handle all the little problems that may come my way at work. Everyday, we all encounter problems. In our lifetime, some of these problems are going to be MAJOR, life-threatening, dangerous ones - problems such as death of a loved one, a serious health concern, a difficult divorce, or the loss of a job. At some point in our lives, all of us will have to walk through some challenging situations in which we will need to focus the majority of our energy just to get through it. Sometimes, we will be successful in navigating through the difficulty, such as the crew of Apollo 13. And at other times, we may fail. When we do fail, we will just need to dust ourselves off, learn from our mistakes, and keep moving forward in life. The majority of problems we face, though, are going to be relatively insignificant. All the little problems, though, have a way of distracting us. We get so focused on the little issues and how they are slowing us down. Any forward momentum stops, and we sit and stew on little problems. But, if we would simply just take a little time to focus some of our energy on "working the problem(s)" and moving forward, then we would expend smaller amounts of time, energy, and resources. In the end, we will be more productive. Our naturally tendency, though, is to FREAK OUT when we encounter even the smallest of problems. While this is certainly understandable at times, we're not solving anything when we have a melt down. There's a saying and a book by the same name, "Don't sweat the small stuff, and it's all small stuff. " Try to relax, assess the problem, and develop solutions to the problem. What are some of the big and small problems you are encountering right now? Are you objectively working the problem? Are you coming up with possible fact-based solutions to your problems? Have you sought out the counsel of others to help with your situation? Go out and work your problems, today.